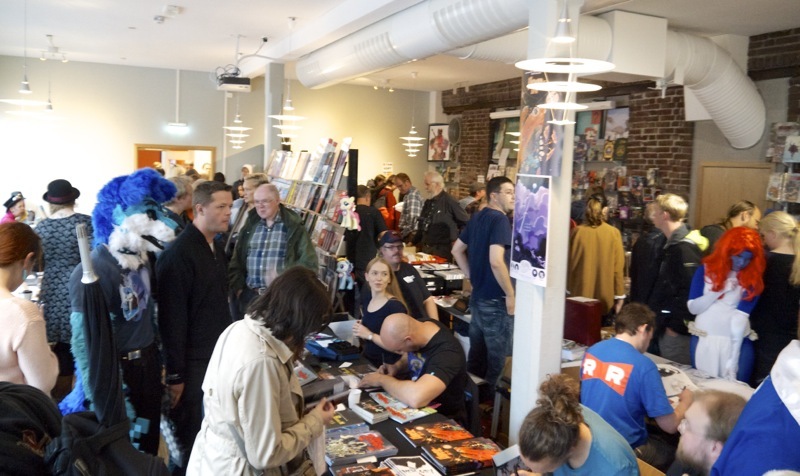 I’ve made a habit out of visiting Raptus – Bergen International Comics Festival every year. And every time, I write a little log like this about what I saw and heard. This year, Raptus is happening from Friday 19th (which was yesterday) to Sunday 21st of September. 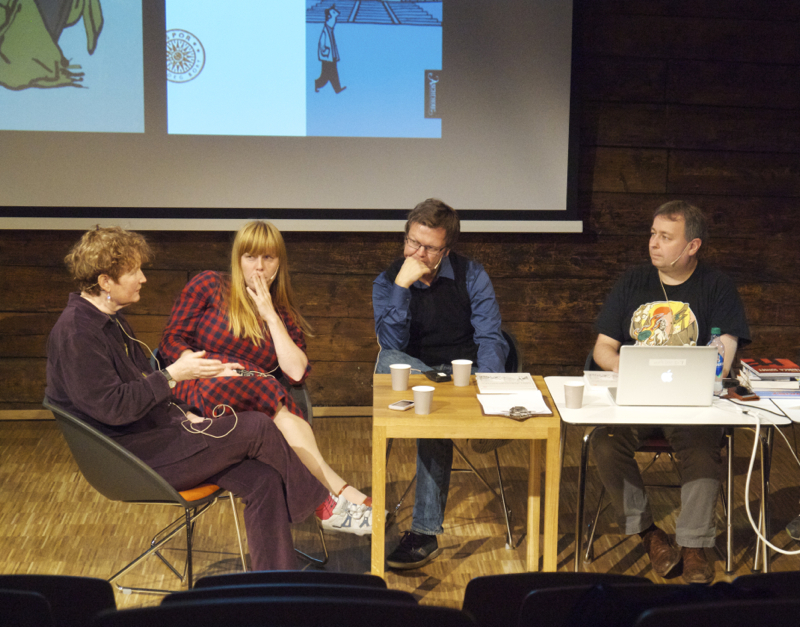 Similar to last year’s festival, Raptus 2014 is being held at Litteraturhuset i Bergen. 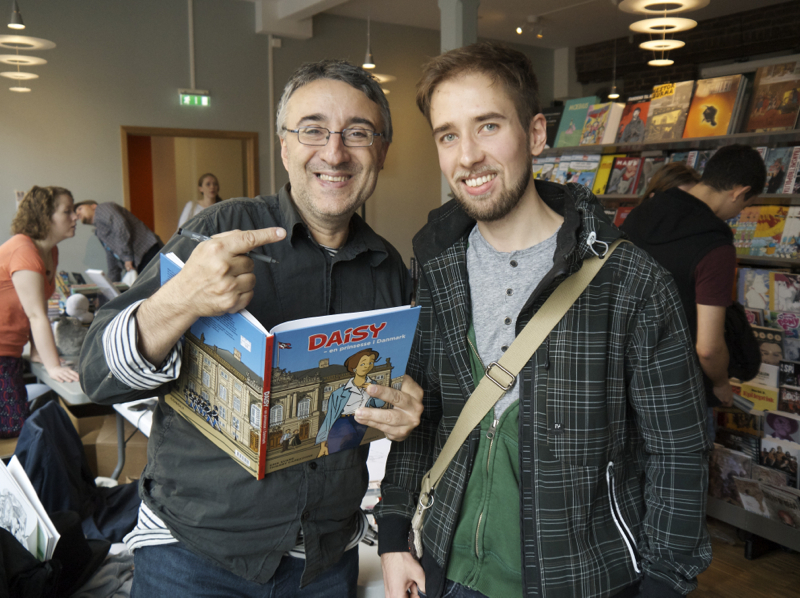 The only thing I had time to do yesterday was to go to Thierry Capezzone’s talk about his newest work, «Daisy». 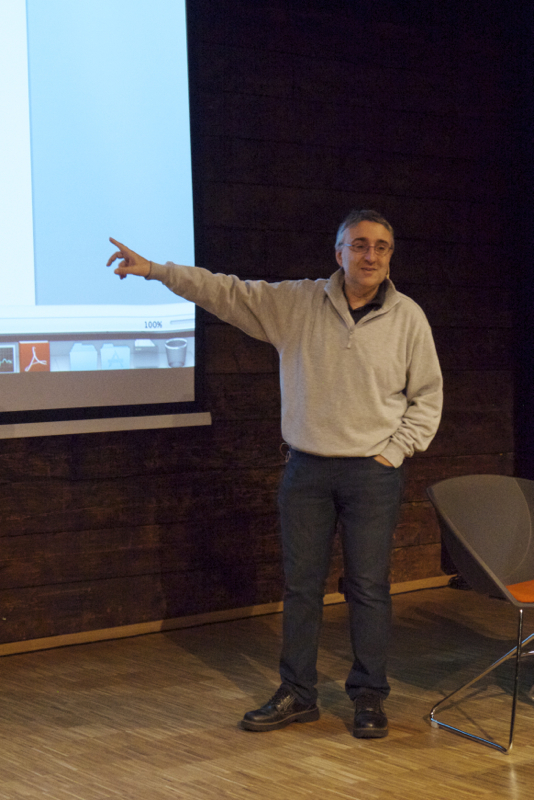 Capezzone has visited Raptus many times before, and it’s always a joy to hear him talk about comics. He has an excellent stage presence and tells a lot of little jokes, so there were bursts of laughter among the audience as he went on to tell us about his process. Capezzone’s enthusiasm for comics is infectious, and I left the venue feeling very upbeat and happy that I had the chance to attend. Bergen was in a grey, typical rainy Autumn day kind of mood today, as I went on my way to the festival venue just before one p.m. 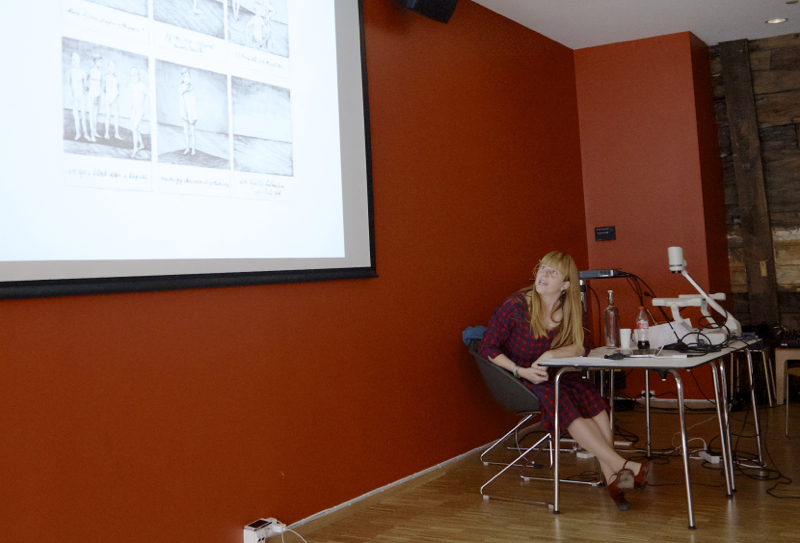 The first thing I did was go to Børge Lund’s talk about his popular comic strip, «Lunch». I had suspected that a lot of people would show up, since «Lunch» is one of the most popular comic strips around at the moment. It’s currently running in 80+ newspapers in 9 countries, and is being translated to seven languages. 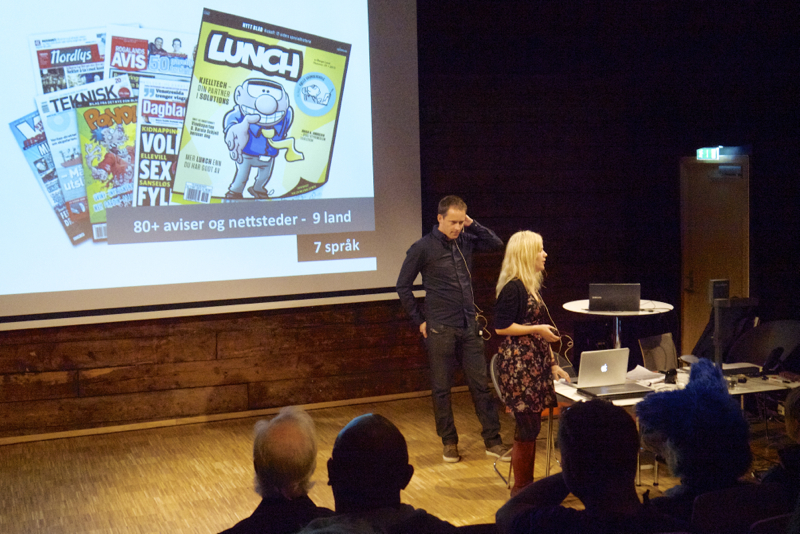 Both Børge Lund and his editor were on stage in front of a nearly filled auditorium, and they talked about how Lund had started making his comic. 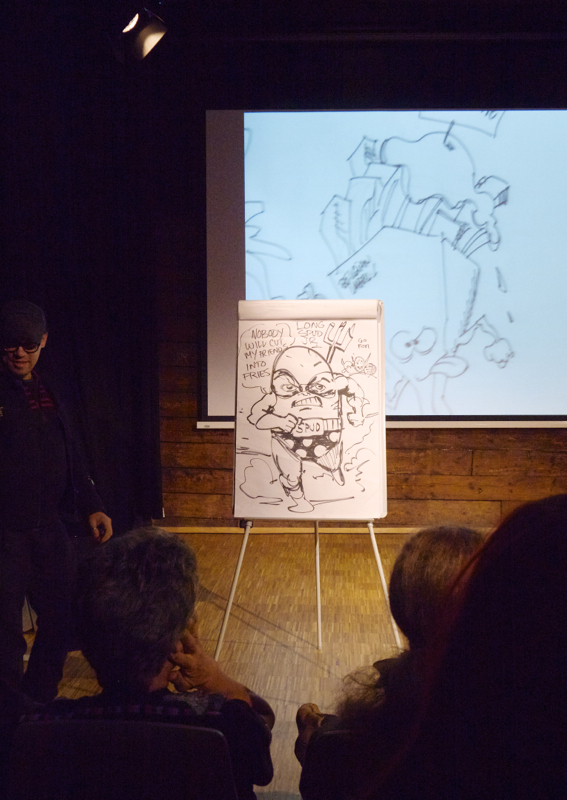 They also talked about how the strip has evolved and his process for coming up with ideas for strips. 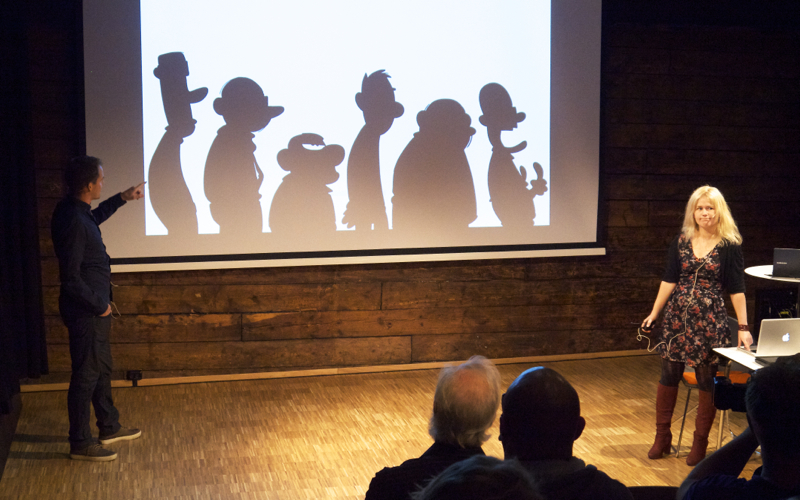 Lund pointed out the importance of being able to see who the characters are just by looking at their silhouette. After the presentation, I bought a copy of the newly released Lunch comic book («Sykt travelt»), and got it signed by the artist himself. Afterward, I stopped by these guys to buy their comic. 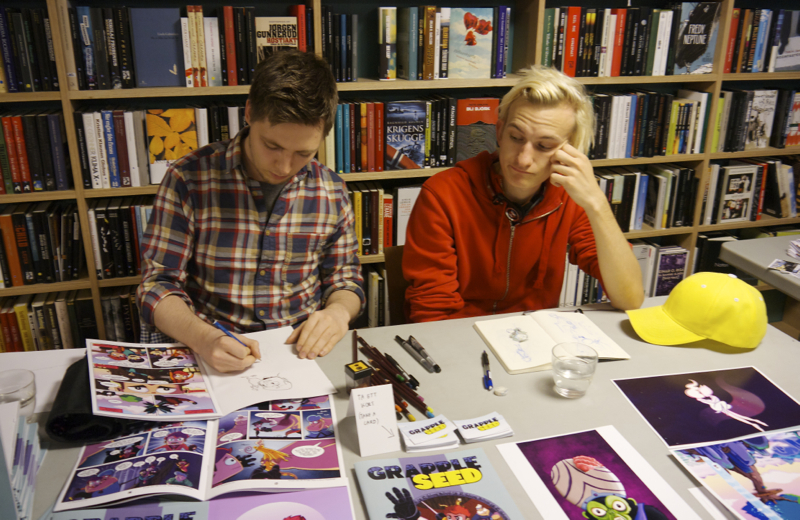 Håvard Heggenhougen and Eddie Jensen are the writer/artist duo behind «Grapple Seed», a comic I had read online and been blown away by the overall quality. The style and concept is impressive, and so is their use of vibrant colors. I’m really looking forward to follow along with the story (they hinted that they soon will resume updating the comic on a regular basis). I walked around looking at stuff for a little while after that. There were a lot of comic fans and cosplayers around, so it was a challenge to move between the shops and artist’s tables. As I mentioned in one of last year’s posts, the venue does feels a bit cramped when there are a lot of people in one place at the same time. Next up was a well attended presentation of «Krüger & Krogh» by Bjarte Agdestein (not present), Endre Skandfer and Ronald Kabíček. 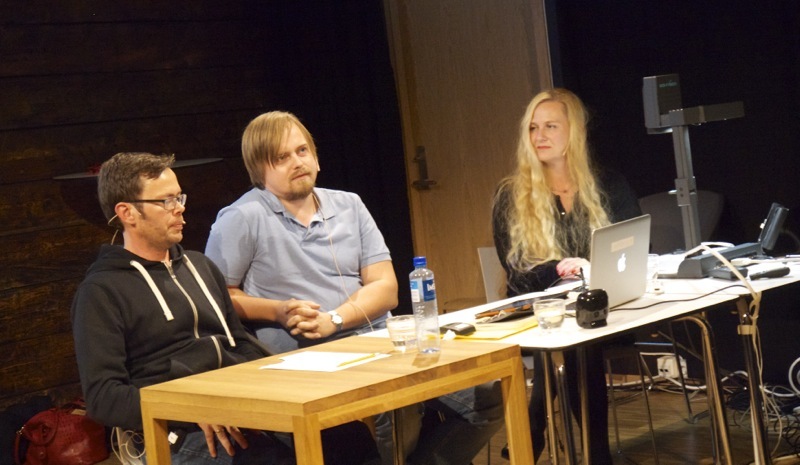 Joining Kabíček (right) and Skandfer (middle) on stage was their editor, Iselin Røsjø Evensen. 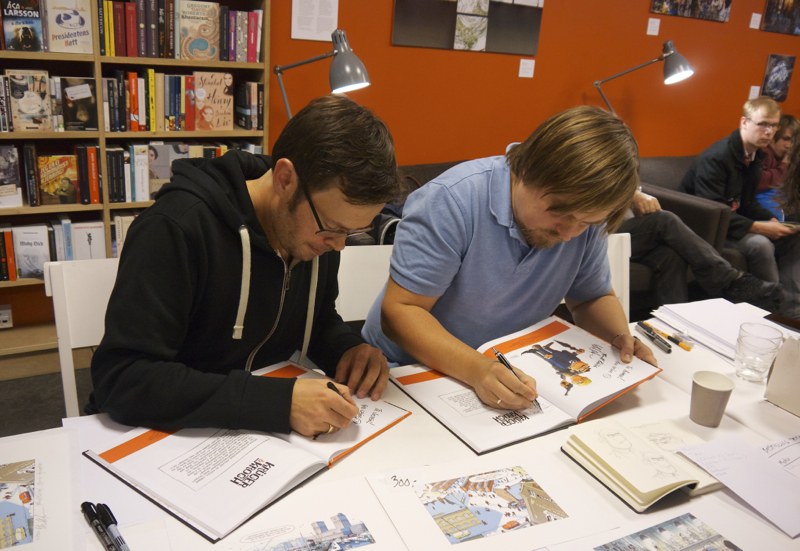 «Krüger & Krogh: Brennpunkt Oslo», a special agent story set to the capital of Norway in the sixties, has become somewhat of a phenomenon in the Norwegian comics scene. 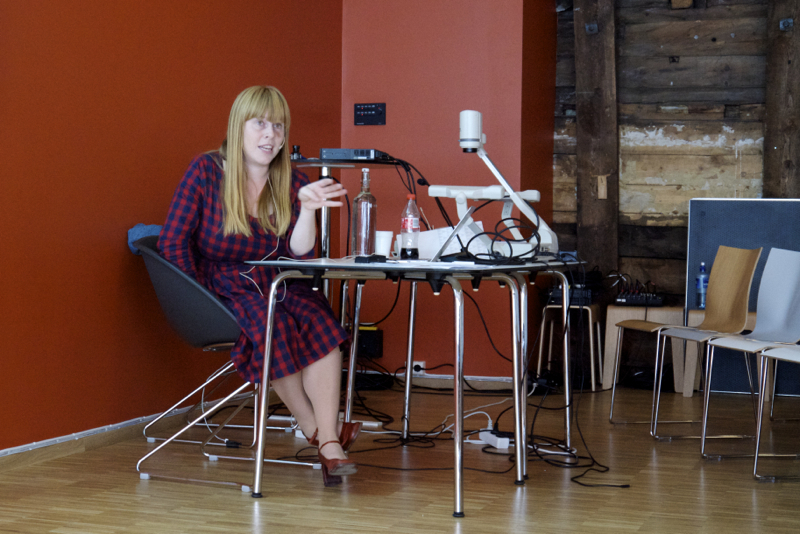 The team has rightfully been praised for their style, thorough research and detailed presentation of Oslo in the sixties. It’s a tremendous body of work, albeit not perfect, as readers have sent letters to the authors pointing out chronological errors. I guess this shows that it’s near impossible to recreate everything perfect through drawing (and with such a high level of detail, it would be pretty impressive indeed). The guys also talked about how their idea to make a detective story had been conceived a long time ago, and that it had been a lot of hard work these past three years to make it into a real thing. Skandfer mentioned feeling pretty great about seeing a huge amount of Krüger & Krogh comic books on display in the window of the most comics-focused book stores in Oslo. After the presentation, I bought a copy of the book and got it signed. I also secured a pretty nice signature and sketch in my Moleskine of awesomeness (or ongoing collection of signatures from comic artists, if you will). That’s it for now! Here are my write-ups from the previous years, just in case you’re interested: Raptus 2011, Raptus 2012 and Raptus 2013 (part 1, part 2).